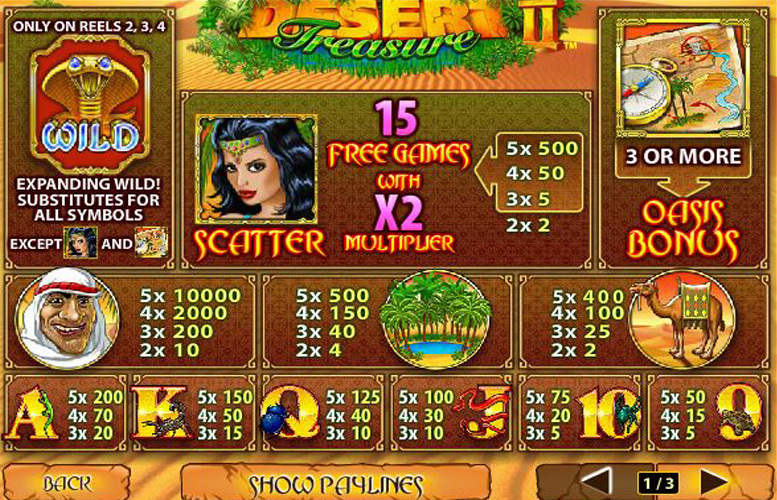 Offering all of the excitement and potential reward of a treasure hunt through the desert without the danger of sand getting everywhere, Desert Treasure 2 is a five reel, three row and 20 payline slot game. 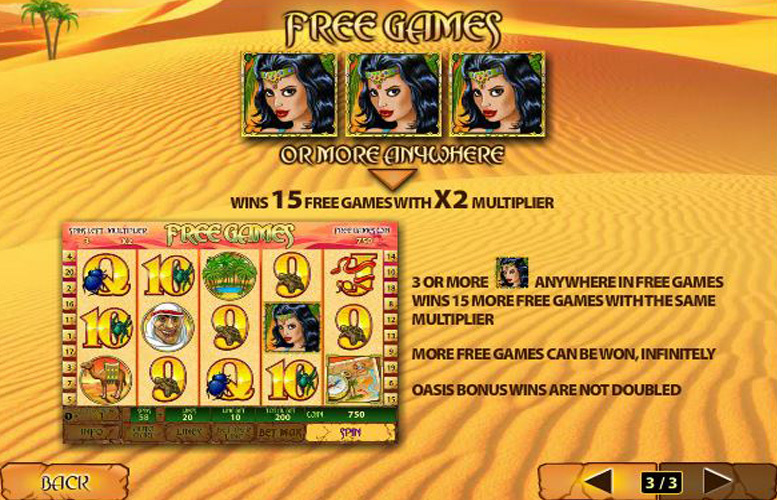 Players must trek through the sands of the desert in search of generous payline jackpots, instant wins triggered by scatter symbols or the welcome relief of the Oasis Bonus round. What’s more, free spins can be earned, too, to further enhance the chance of striking it big. The game’s top payline jackpot is worth £100,000 at the highest bet level and, as such, is one of the more generous payouts around. Additional game features, such as the bonus round and free spins, introduce even more ways to win. Changeable active paylines, coins per line and coin values offer a good deal of choice when it comes to stake amounts. After the top payline jackpot, the other payouts in the slot’s main game fall away in value dramatically. Given the slot’s interesting theme, the symbols on the reels and general graphics of the game could be far more attractive and innovative. The main element of the Desert Treasure 2 slot is a fairly traditional five reel, three row and 20 payline game. As such, the highest paying jackpots are achieved when five matching symbols line up consecutively along an active payline. The most valuable payline combination of all is one made up of five matching male local symbols, which pays out at a rate of 10,000 times a player’s chosen bet per line. The highest possible line bet is £10, meaning that the top jackpot available is one of a cool £100,000. As well as the main game, Desert Treasure 2 also includes a number of additional features to enhance the fun and the winning potential of the slot for players. These features are its wild symbols, scatter symbols and Oasis Bonus symbols. Showing off an image of a fearsome looking cobra, the Desert Treasure 2 wild symbol can appear anywhere on reels two, three or four. When it does appear it substitutes for all symbols, apart from the scatter and bonus symbols, and expands to cover the entirety of its reel. Depicting a beautiful female local, the slot’s scatter symbols increase a player’s chances of winning in two different ways. Firstly, if two or more of the symbols appear anywhere on the reels, variously sized instant wins are triggered. Secondly, if three or more of the symbols appear, 15 free spins are triggered which are all subject to an outstanding 2x multiplier. Providing players with a map and a compass for their treasure hunt through the desert, three or more Oasis Bonus symbols along an active payline, trigger the Oasis Bonus round. 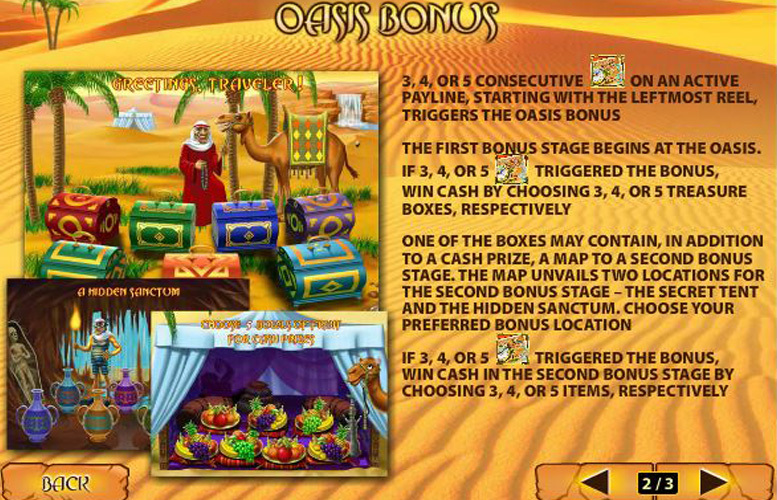 At the oasis, players can choose either three, four or five treasure chests (depending upon how many symbols triggered the round). The selected chests will either contain cash prizes or a map to the bonus’s second level. At the second level, players must choose to explore either a secret tent or hidden sanctum and can again select either three, four or five chests. Away from the special symbols described above, the symbols on the Desert Treasure 2 reels depict things an explorer may find in the desert, including camels, insects and other such critters. The most valuable regular symbols, in terms of payline combinations, are the male local, the oasis and the camel symbols. We have already discussed the male local symbol in terms of the game’s top jackpot and, unfortunately, the payouts from the other symbols are much lower. 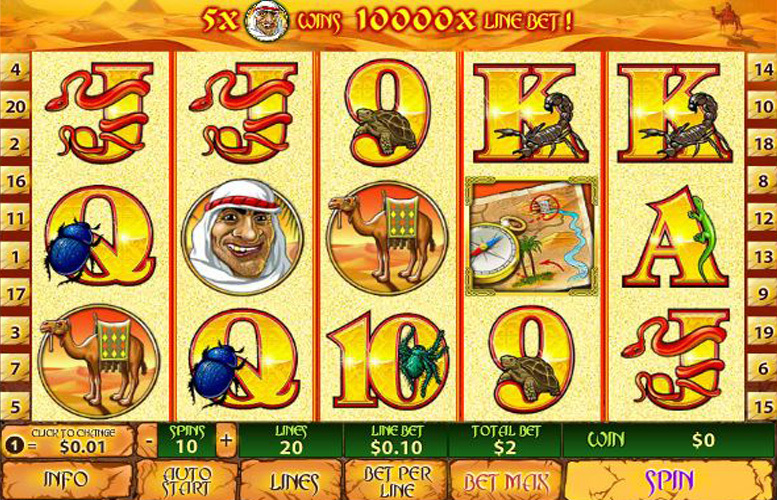 Five of the oasis symbols, for instance, pay at a rate of 500 times the line bet, whilst the rate for five of the camels is 400 times the bet per line. The minimum possible total bet per one spin of the Desert Treasure 2 reels stands at just 1p, and the maximum total bet can be as much as £200. In order to change the amount they stake per spin, players must adjust the number of active paylines, the number of coins bet per line and the value of those coins. Anywhere between just one and the slot’s maximum 20 paylines can be active for each spin, and anywhere between one and ten coins can be bet per spin. Those coins, meanwhile, can be set at values ranging from 1p to £1. Combining a fun theme, a generous top jackpot and a number of interesting extra features, there is a lot to like about Desert Treasure 2. The game, however, is not without its faults and so it is important to look at both sides of the coin when providing an overall opinion. On the positive side first, the game’s highest payout of £100,000 is indeed one of the more generous around. Scatter wins, free spins with multipliers and a bonus game, what’s more, can all provide extra ways to win. On top of that, those features also introduces a good deal of added excitement and fun to gameplay. The major downside of this slot, however, is that payouts below the £100,000 top jackpot are considerably less valuable. The second best payline combination, for instance, will pay out just £5,000 at the highest bet level. That is the slot’s only major weakness, however, and as such Desert Treasure 2 is unquestionably a game that most players will enjoy. This game has a rating of 5 / 5 with 480 total reviews by the users.